We have finally reached the last day of 2011. Wishing you all a wealthy and healthy new year! This is going to be my last recipe of 2011. I will try my best to find more good recipes to share with you in the coming year. Happy New Year! Heat 1 tablespoon of olive oil in a skillet over medium heat. Saute tomatoes and half of the minced garlic until tomatoes are softened. Add in rosemary, basil and vegetable broth and cook for 1 minute. Remove from heat and place them in a blender. Clean the skillet and return to medium heat. Heat the butter and the remaining 1 tablespoon of olive oil. Saute the remaining minced garlic. Add shrimp to the garlic and saute until the shrimp start to turn pink. Add the pureed tomato sauce and heavy cream to the shrimp. 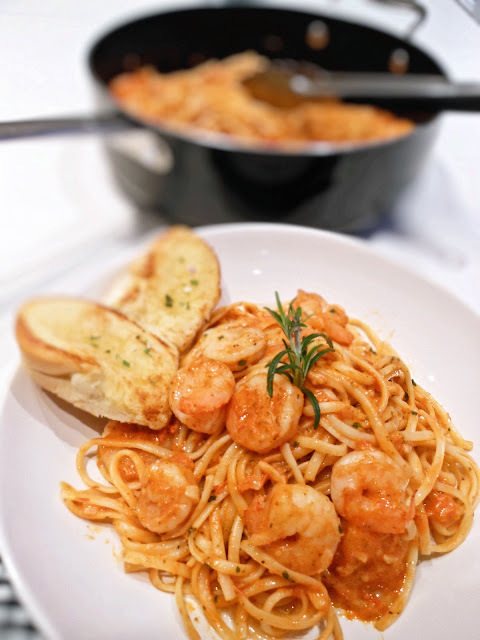 Add cooked linguine pasta to the skillet and toss with the sauce and shrimp. Drizzle some olive oil over the linguine. I have been traveling for the past month and I really need to eat a comfort pasta dish like this! Hmm I've never added vegetable broth for a pasta dish like this. That's a great idea! We plan on eating Chinese food tonight at a restaurant. I really wish to have this for dinner. Maybe tomorrow or this week!! Kind of excited! Thanks for the kind words, Nami! Please let me know if anything needs to be improved. You are the expert!